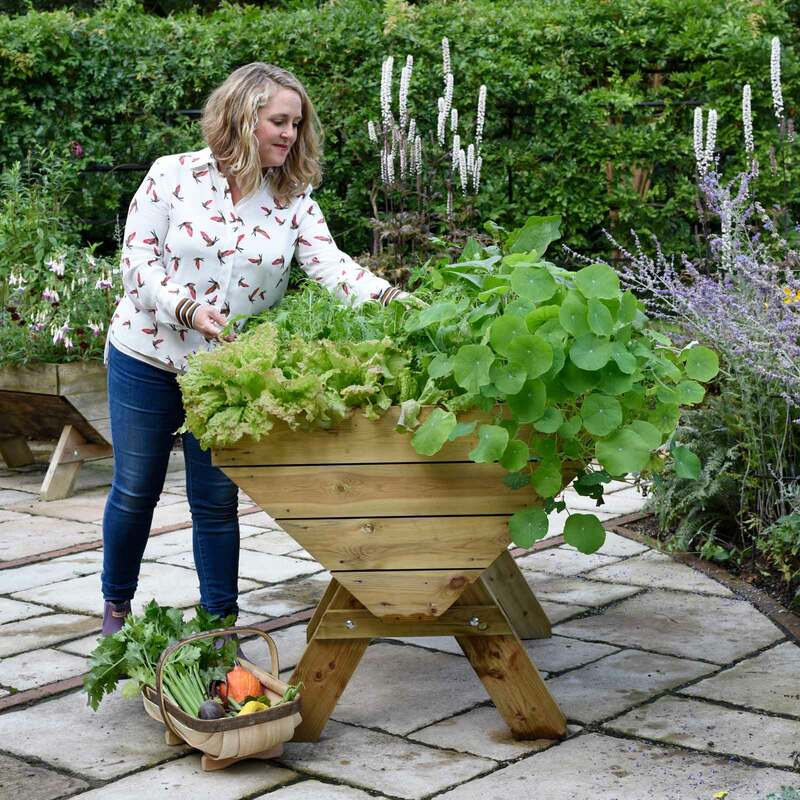 The Maxi Manger Trough Planters have been designed to offer a stylish and practical way to grow your own fruit and vegetables, perfect for the patio or deck, or to create an attractive floral display. Getting the most from these Maxi Manger Trough Planters isn't difficult and even though quality raised beds and planters are - pardon the pun - a huge growth area as gardeners realise the benefits of growing their own vegetables, fruit, salad and herbs in waist height comfort with little or no maintenance and free from certain pests, we're still rather pleased with the stylish Maxi Manger Plant trough we've both researched and designed. Standing 79cm off the ground, 83cm wide and available in 4 lengths (2ft/0.6m, 4ft/1.2m, 6ft/1.8m & 8ft/2.4m - image shows 4ft trough planter) these wooden troughs provide growing options that single level raised beds can't dream of offering. 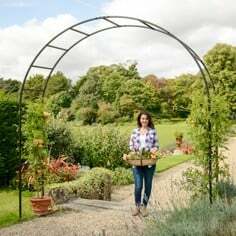 Plant your salads and shallow rooting crops round the perimeter of the vegetable trough and let the plants (including carrots and parsnips) which require extra depth really stretch their legs in the centre, where 45cm of soil is available. These stylish wooden planters are also proving popular as flower troughs, ideal for creating a stunning floral display in your garden, perfect on the patio for a splash of summer colour. 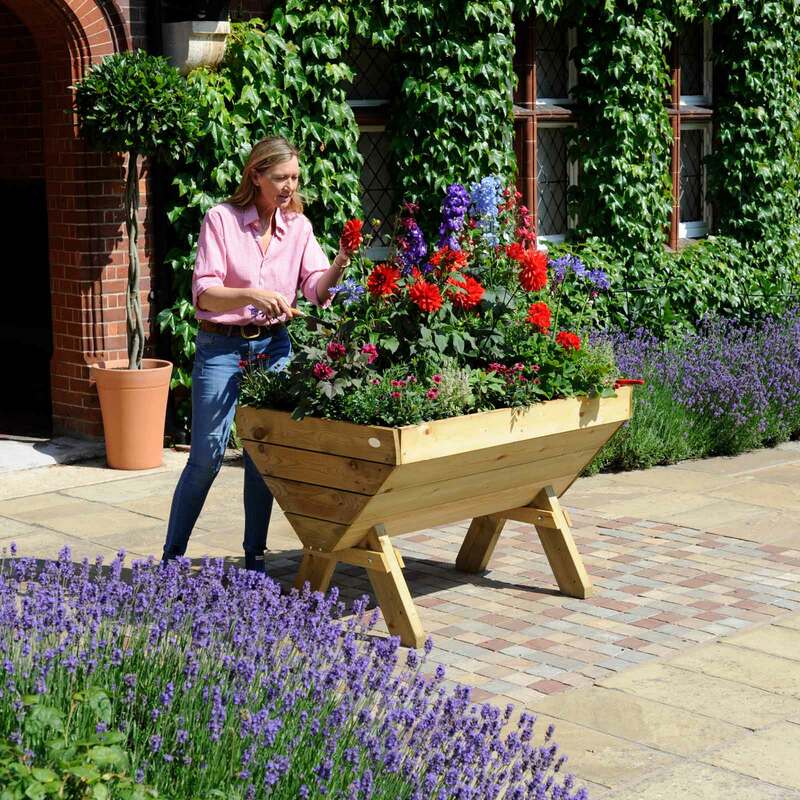 Carrying a 3 year structural guarantee, you can be sure the Maxi Manger Raised Planter won't let you down and your patio will be grateful for the thick, fitted, non-woven polypropylene fabric liner which aids water retention, contains fine sand and compost and helps prevent leaching. 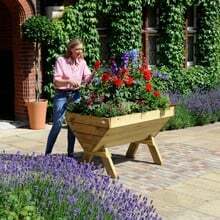 We've also added smaller versions of the Maxi Manger Trough Planter - the Mini Manger and Micro Manger which are also available in 4 lengths and are ideal for the patio or courtyard. 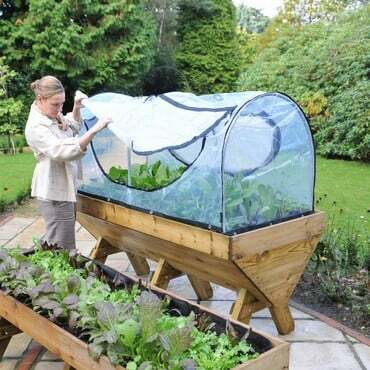 And you can turn your Maxi Manger Raised Planter into the ultimate patio vegetable growing system with the new Hoops and Cover Kits - designed exclusively for all lengths of Maxi Manger! 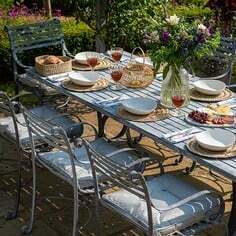 Made from Scandinavian softwood sourced from sustainably managed forests. 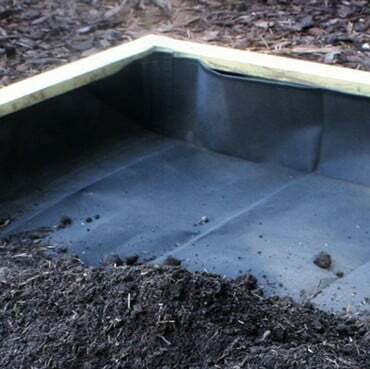 When working out the amount of compost required to fill your Maxi Manger Raised Planter, use the following simple guide - each 60cm (2ft) length requires approx 120 litres of material. Don't forget to add plenty of organic matter to improve both soil structure and water retention! I managed to assemble two maxi manger troughs on my own, but it would have been easier with two people. I highly recommend the use of an electric screwdriver. 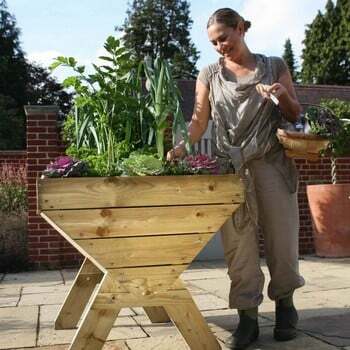 The completed trough is very sturdy but heavy and I would recommend carrying the top and base to the intended location before final assembly, especially if, like me, you will have to do this on your own. 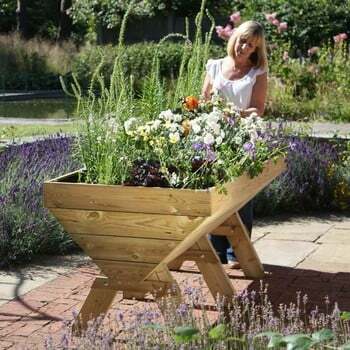 Once filled and planted up, it would be far too heavy to move safely. It is early days yet to really rate performance and longevity. 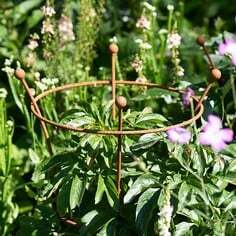 My two troughs have been sown with carrots, various varieties of salad leaves and strawberries to trail over the edge. 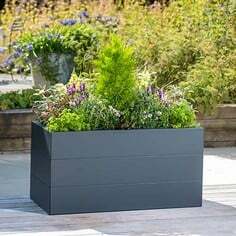 The planters are standing on a well trodden base of chipped bark and I have placed them in front of my green house to act as a screen. Bought this in the spring so I waited for a full growing season to review. 6 ft version as we had a perfect spot for it. No complaints and so good for our backs. No bending needed. Worth paying extra for a sturdy piece of kit. Good cropping, especially runner beans. We've given you an idea of how much soil you'll need to fill your Maxi Manger Raised Planter above, but it's the quality that counts - that's why we're proud of our tie-up with Rolawn, recognised as the market leades when it comes to topsoil and soil improvers. 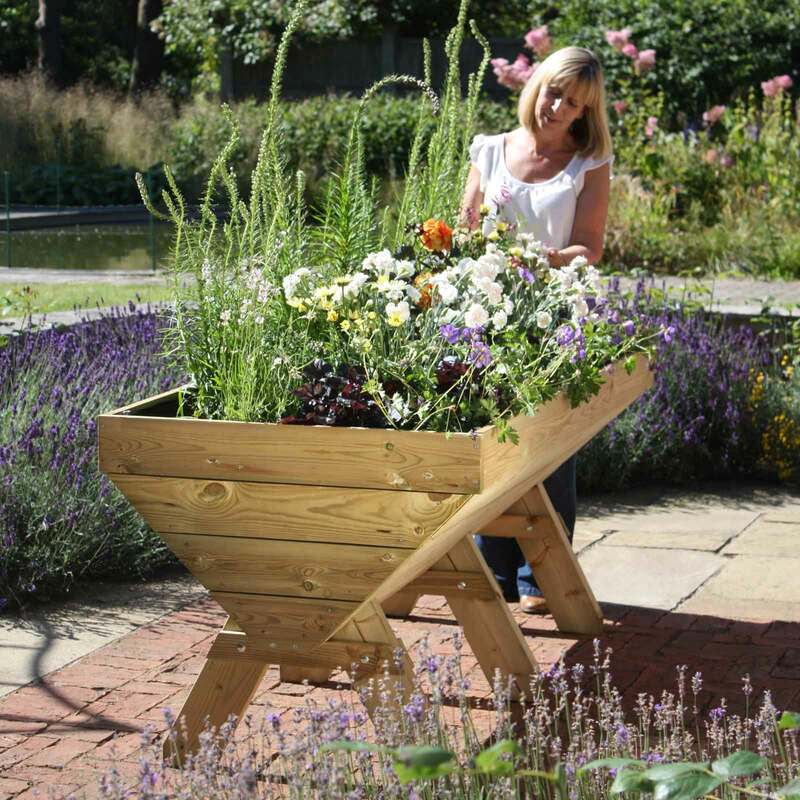 We recommend you use the Rolawn soils to fill around 75% of your Maxi Manger planter, and make up the missing quarter with some good old organic matter in the form of well rotted manure, garden compost or even some garden centre-bought bags of farmyard manure (FYM). 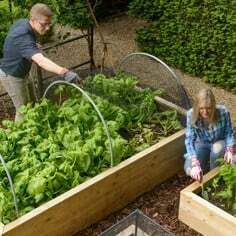 If you are intending to plant the beds up almost immediately after filling, you must make sure any manure is well-rotted down as the fresh variety will release ammonia as it decomposes, and this can harm plants. Adding this bulky organic matter - Strulch is another alternative - will help with water retention and soil structure in general as light raised bed soils are notorious for rapidly drying out. 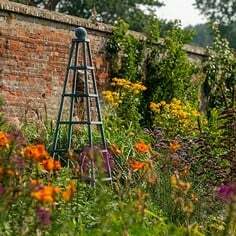 After your first season of growing, you can think about applying stronger manures which will have the winter to break down – or even grow a green manure crop. 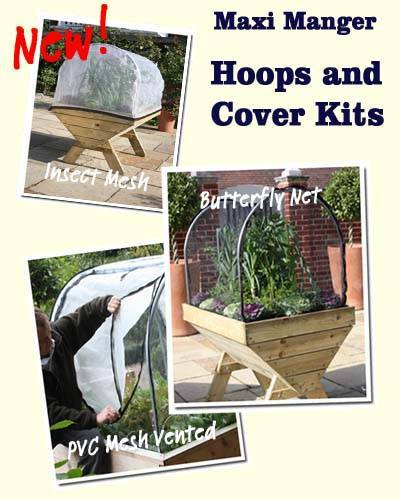 Protect your Maxi Manger grown crops with our NEW range of Hoops and Cover Kits, designed specially for the Maxi Manger. 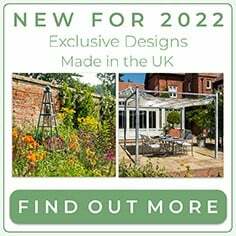 Choose from galvanised steel 19mm hoops, Fitted Insect Mesh covers, a tailored and seam stitched Butterfly Net or the heavy-duty PVC Mesh Vented Cover for all year growing. 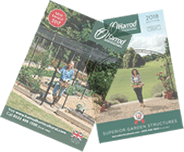 Buying the hoops and your choice of cover in kit form is the easiest option but we've also made the covers available separately should you wish to move with the seasons and keep your crops protected all year long! 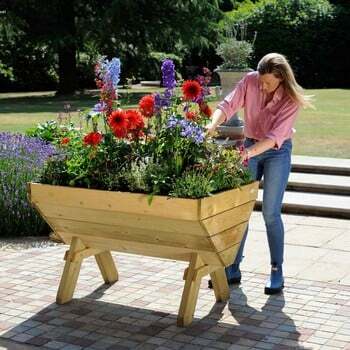 Find the perfect containers for your garden from this fantastic selection - Maxi Manger Trough Planter available in four lengths.